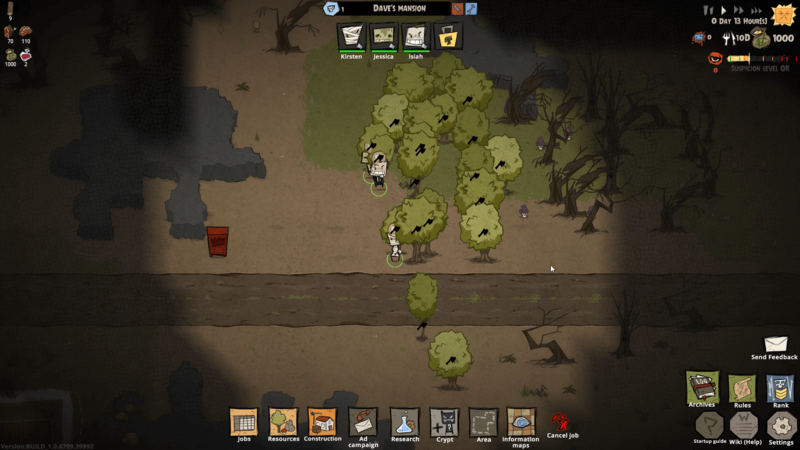 Machiavillain takes the traditional colony or tycoon game and gives it a spooky spin. Running a murder mansion — one teaming with monsters, serial killers and sinister traps — is an idea that I’m surprised hasn’t been made into a game before. Machiavillain ends that absence, challenging players to manage a small group of minions and turn a deadly wasteland into an efficient, innocent-murdering homestead. Wild Factor‘s Machiavillain allows you do this through assigning tasks to your underlings, researching new items for the building processes and luring innocents to your land. Once they’re there, you must trap and kill them as efficiently as possible — all while trying to play by the rules: kill the virgin last, don’t kill the dog and only kill them when they’re alone. All of that, plus you also need to keep your suspicion low so as not to attract monster hunters. Allowing visitors to photograph your monsters, call for help or even escape will lead to your suspicion levels ramping up. So it is important to create a well-organised manor which lets you lead the innocents in before turning them into monster food. It’s also important to — as any good monster would know — clean up the blood and gore to make sure you don’t alert them to your presence too early. While it could definitely be taken as a dark subject matter — especially as some of the innocents are meant to be children and animals — it is also handled with a solid, well-balanced sense of humour. Not only that, but the cartoony art style takes the edge off — that and the monster naming and interlaced story as you progress through the villain ranks. The game starts off with some fantastic and commendable pacing. 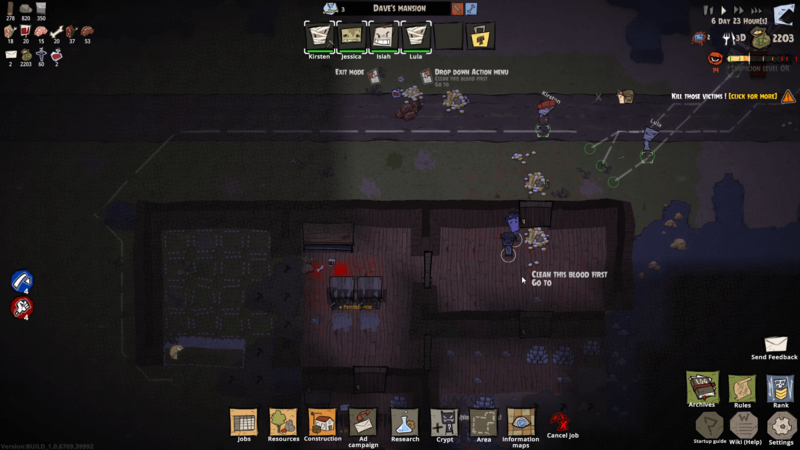 Most colony-management games dump players into the game with a few tooltips and a few days’ worth of resources. Machiavillain beats these on both counts. A loose story — one of a minion become master who intends to rise through the ranks of villains — gives the game a ‘rank’-based structure which doubles as a tutorial, each steering you down the path of expanding your venture with new rooms, monsters and tools. It is also very generous with the starting food resources, giving you more than enough time to get set up when you first start. Food and resource gathering is definitely the core of the early game. Each monster only eats specific types of food, and the process of learning which eats what is one that needs to be learned early. If you add a vampire to your team, but haven’t got the research to turn ‘cleaned-up’ bloodstains into blood vials, you’re really missing a trick and may soon be missing a minion, too. After the first few ranks, however, Machiavillain hits an awkward mid-game, which does seem to go on for a little bit longer than it should. As you gain control of the area around you, chopping down vicious, haunted trees and mining metals and gold out of the mountains, the ranks still make you advance through quantity of people murdered. All of a sudden the research tree and second-tier resources (from refining existing ones) come upon you and you’ve not got quite enough monsters to balance the economy of running the site and advancing in good pace to the next rank. If you shake through that middle part, however, the game becomes exceptionally fun. It’s at this point where the interior decoration and more complicated housing elements of the game come into play. Once you’re refining resources, you can start making lighting, televisions and rotating bookcases. At this point the game really starts to shine — you’ll lure in a dozen innocents, split them up using distractions and pivoting walls and pick them off to maximum effect. As you unlock more innocents to lure in, you’ll need to construct dedicated rooms in your mansion. Trying to get the brainy nerd to separate from the pack? They’ll make a bee-line for that grand library you’ve just built. And, if you’ve still got your starting minions with you at this point,they’ll be much better for it. While there are plenty of different monsters — each with their own quirks and each of those with their own skills — the starting, weaker ones underline the experience system exceptionally well. Each minion, beside having its own name, funny bio and skills, can level up through partaking in the murdering. Each of the different monsters has a different skill tree, each extensive enough that there’s a clear difference between new monsters and their veteran counterparts. These skills range from stunning enemies to being able to disappear from sight for a handful of hours — all useful, and nicely varied. The game’s combat is a straightforward affair, simply a case of selecting the monsters you want, then clicking on who you want them to attack. They’ll automatically use any of their unlocked abilities while swarming on the targets, and invariably make quick work of their foe. That said, you’ll be spending a lot of time clicking because your minions completely lack any free will or initiative, left standing there absent minded while chaos unfolds around them. While the game has a robust job assignment system — similar to RimWorld, where you authorise/allow groups of tasks like cleaning or cooking — you’ll have to revisit it quite frequently to make sure that all tasks are covered by a minion or two. Combat isn’t covered by this, however there are buttons which stop all minion jobs and restart them — useful for ensuring that no monsters walk in front of the innocents ahead of time. What Machiavillain would benefit from would be an ability to paint a ‘home’ zone, and a toggle which has your monsters auto-attack when innocents venture within those zones. You would still need to micromanage to ensure that ‘the virgin dies last’ and nobody kills the dog — but the facility for painting zones is already included in the tools which allow you to set areas for cleaning and putting out fires. That said, the UI is extremely accessible and does a great job of showcasing all the owned resources, as well as keeping each of the different building/maintenance options quick to reach. 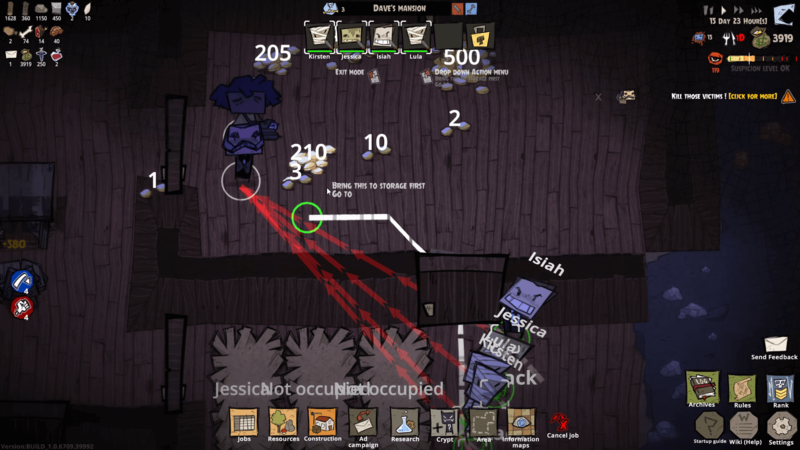 There are a lot of other design decisions regarding quality of life which have been made: rooms auto-identifying and labelling (which ties into villain ranks) based on the objects within; more complicated monsters gated behind a separate tech tree than the housing unlocks; and easily locatable reminders of the ways to score more points with your kills. Machiavillain is an enjoyable colony sim, let down only by a strange pace around the mid-game point. It is a fantastic management experience and one that launches feeling feature and content complete, unlike many of its contemporaries. 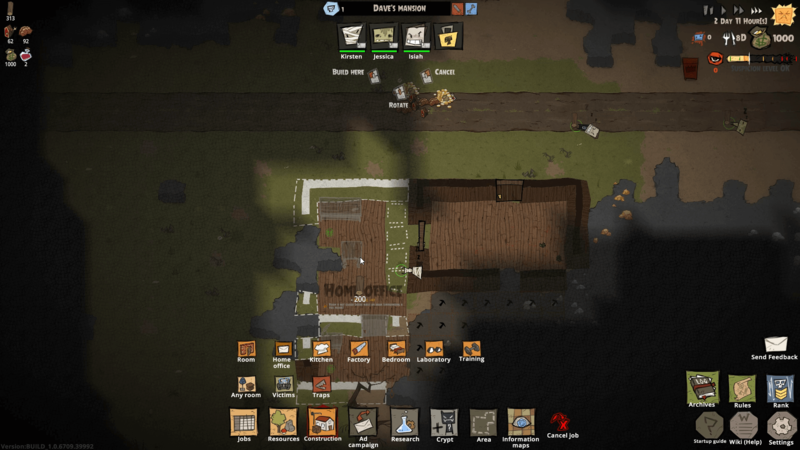 If you’re looking for a fun, horror-themed colony sim, you don’t need to look any further. Machiavillain is available now for PC, Mac, and Linux. I found the lighting to make the game almost unplayable.